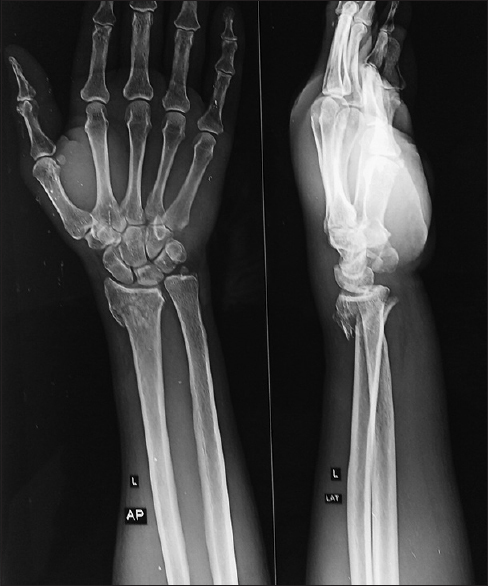 Context: Diaphyseal fractures of the radius and ulna are common in the pediatric population. The standard management for pediatric forearm fractures remains conservative management with closed reduction and immobilization with above-elbow plaster cast. Although the fracture unites readily, malunion is very common. Stiffness of joints and compartment syndrome are other complications of conservative management with plaster cast. The introduction of titanium elastic nailing system (TENS) has changed the treatment scenario of fracture of both-bone forearm. Aims: The aim of this study is to evaluate the functional and cosmetic outcome of the management of fracture both-bone forearm by closed reduction and internal fixation with titanium elastic nail system. 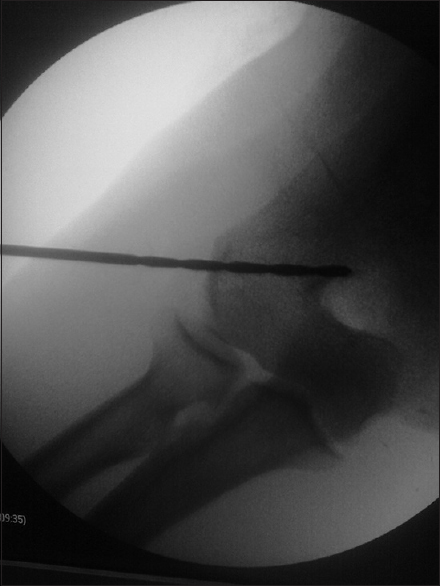 Subjects and Methods: A total of 40 patients aged 5–15 years with fracture of both radius and ulna were managed by internal fixation with titanium elastic nail. Closed reduction under image intensifier control was achieved in most of the patients. Prospective follow-up was done for 6 months. Results: Results were analyzed in reference to union, symptoms, and range of motion of adjacent joints using Price et al. criteria for outcome evaluation. In our study, 87.5% of patients showed excellent, 10% showed good, and 2.5% showed fair outcome. Conclusion: Better functional and cosmetic outcome with minimal complications is achieved with internal fixation with titanium elastic nail system. TENS may be considered as an alternative to conservative treatment. Background: Humerus shaft fracture accounts for 20% of all humeral fractures. Comminuted fracture of humerus requires great surgical skill to obtain stable fixation. 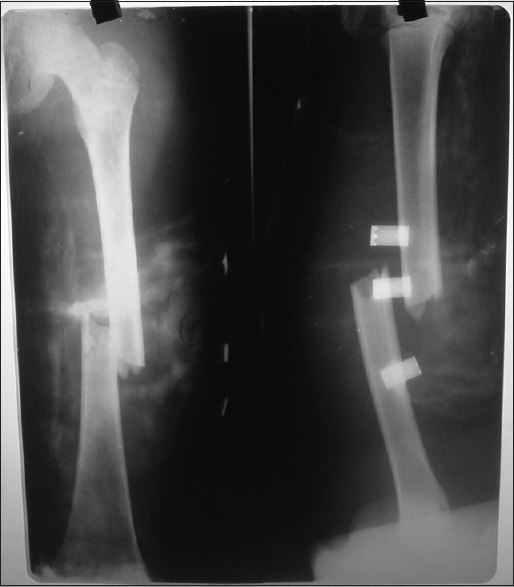 The aim was to study the effect of locking compression plate (LCP) in the fixation of comminuted diaphyseal humerus fracture. 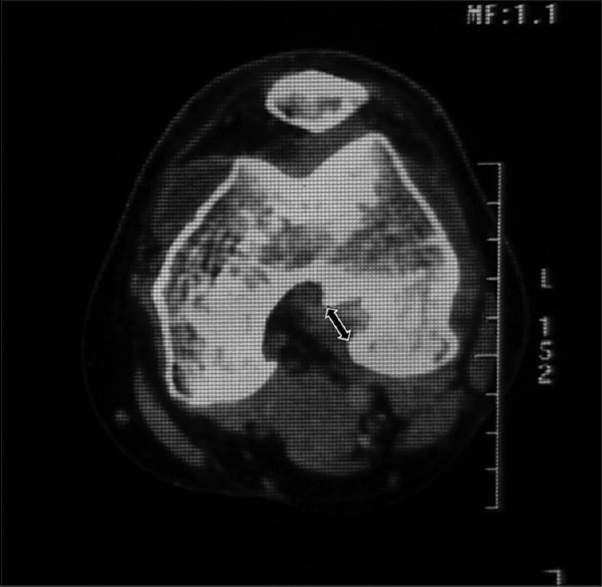 Materials and Methods: This is a prospective study done over 12 months in which 30 consecutive skeletally mature, closed diaphyseal comminuted humerus fractures underwent fixation with LCP and outcome evaluated in terms of radiological evidence of healing, functional outcome, and complications if any. Results: Union of all thirty fractures was achieved primarily. 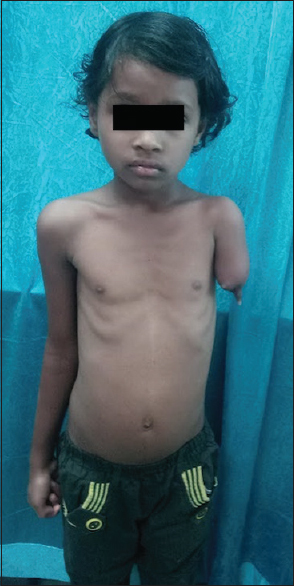 There was no implant-related complication. The mean Mayo Elbow Performance Score at 6-month follow-up was 90.5, while the mean University of California and Los Angeles score (UCLA) at 6-month follow-up was 29.66 with minimum 24 to maximum of 34. Conclusions: Internal fixation of comminuted diaphyseal humeral fractures with locking plates described in this study allows an intensive program of rehabilitation immediately after surgery and is associated with a high union rate. Introduction: Clubfoot is a common congenital deformity with incidence of one in thousand live births. Ponseti method is currently the gold standard for treatment of clubfoot which conventionally involves weekly plaster changes. A prospective comparative study was carried out at our institute where we compared one group with weekly plaster change to other group with triweekly plaster change using the classical Ponseti protocol of manipulation. Methods: A total of 40 feet, divided into two groups, were randomly allocated to either Group A – 20 feet (standard Ponseti) or Group B – 20 feet (accelerated Ponseti). Group A underwent serial manipulations and casting once a week and Group B received manipulations and castings thrice a week. Pirani score was documented at presentation, at each cast, and at the time of removal of final cast to assess the success of treatment in terms of Pirani score ≤1. Results: The average number of casts needed for correction in accelerated group was 7 (16 patients, 20 feet) and in standard group was 6.35 (15 patients, 20 feet). The mean follow-up in accelerated group was 7.84 months whereas in standard group was 6.66 months. Tendoachilles tenotomy was required in 65% feet in accelerated group and 55% in standard group. Conclusion: Both methods standard and accelerated Ponseti have proven to be equally efficacious for the management of clubfoot in our study. However, the accelerated method has a overall shorter treatment duration making it more cost effective and convenient for the parents. As patient is under direct observation of surgeons, any complications are detected early and easily. Overall, the accelerated technique is more practical, beneficial, and labor-saving for poor patients from rural part of India where recurrent visit to tertiary government care center is inconvenient and troublesome. Background: Chronic Anterior Knee pain is the most common post-operative complication following Intramedullary interlocking nailing of Tibial shaft fractures. Its incidence has been reported to range between 10 % to 86% but no definite cause can be attributed. This study was conducted to analyse the prevalence & severity of anterior knee pain in post tibial nailing patients with relation to nail protrusion, approach and proximal screw size. 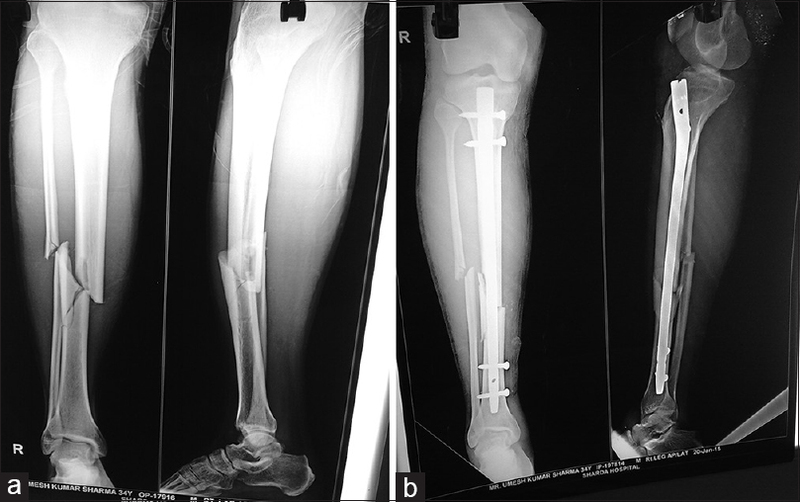 Methods and Material: 92 consecutive patients with an isolated tibia shaft fracture; treated with reamed IMIL nailing from 2014 to 2016 were included in the study. Chronic Anterior knee pain was assessed as per VAS. Besides X-ray, Ultrasound evaluation of patellar tendon morphology and nail protrusion was done. Statistical analysis used: student t test. Chi square test. Results: In the symptomatic group (28), 25patients (89%) had nail protrusion and only 3 patients (11%) did not have nail protrusion beyond proximal tibia cortical bone. In asymptomatic group, 20(33%) patients had nail protrusion and 40(67%) patients did not have nail protrusion. This difference was statistically significant with P value 0.00. In symptomatic group, 11(39%) patients had larger screws and 17(61%) patients had normal length screws. In asymptomatic group, 41(68%) patients had normal length and 19(32%) had large screw. P value came out to be 0.48. Conclusions: Anterior knee pain may be related to protrusion of nail beyond proximal tibial cortical bone [p value 0.01], and larger proximal screw length [p value 0.08]. Introduction: The objective of this study was to find the outcome of interlocking nail in fracture tibia. 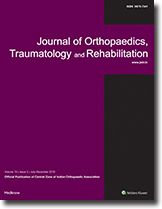 Methods: This study was conducted in the Department of Orthopaedic Surgery in SMS and R, Sharda University, from December 2010 to December 2015. Two hundred and seventy-eight patients were recruited from emergency and outpatient department having closed fracture of tibial shaft. The clinical results of our study were rated on the basis of the criteria of union, nonunion, delayed union, or malunion. All patients were operated under general or spinal anesthesia. All patients were followed for 9 months. Results: Nearly 86.33% (240/278) patients had union in 90–150 days with a mean of 110.68. Union was achieved in 10.07% (28/278) patients in 95–109 days with a mean of 103.38. About 9.35% (26/278) had delayed unions and 4.31% (12/278) had nonunion which were treated with dynamization and bone graft. The results were excellent in 86.33% (240/278) and good in 9.35% (26/278) patients. All of our patients had full range of motion of their knees and ankles. Conclusion: We concluded that this technique is advantageous because of early mobilization (early weight-bearing) and less complication with good results and is economical. Introduction: Tennis elbow is a common disease in orthopedic surgery. Recently, the high-rate outcomes of local injection of platelet-rich plasma (PRP) were reported. This study was conducted to evaluate and compare the results of combining the percutaneous drilling of lateral humeral epicondyle and local injection of PRP for resistant tennis elbow to other more invasive techniques. 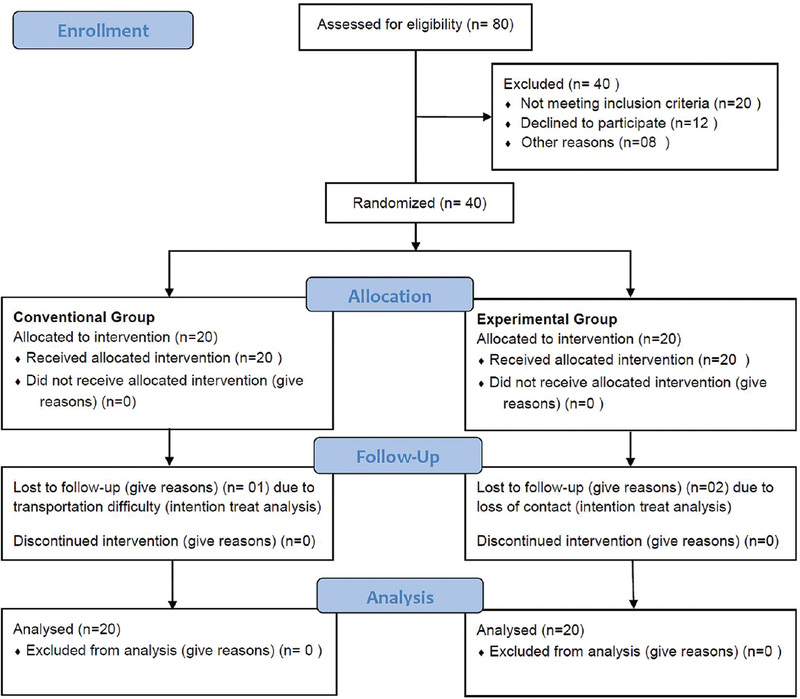 Patients and Methods: Between January 2014 and December 2015, 25 patients underwent this study. The patients underwent percutaneous drilling of lateral humeral epicondyle and local injection of PRP. Results: The average follow-up time was 18 months (range: 12–27 months). Eighteen patients (72%) were rated as having excellent results, 4 patients (16%) were rated as having good results, and 3 patients (12%) were rated as having a poor result without any improvement. Conclusions: Combining the percutaneous drilling of lateral humeral epicondyle and local PRP injection in tennis elbow improved the results and compared favorably with other techniques. Context: Enlargement of osseous tunnels following anterior cruciate ligament (ACL) reconstruction is a newer discovery. This phenomenon is particularly valuable in planning for revision ACL reconstruction. Aim: The purpose of this study was to evaluate prospectively the increase in size of the tibial and femoral bone tunnel following arthroscopic ACL reconstruction with quadrupled hamstring autograft and fixation with biodegradable interference screws. Materials and Methods: A prospective study was conducted on 10 patients who underwent arthroscopic ACL reconstruction with quadrupled hamstring autograft and fixation with biodegradable interference screws. Tunnel width was measured at postoperative 2 weeks and an average of 1-year follow-up (range: 10–13 months). Clinical evaluation was done as per the International Knee Documentation Committee form. Paired Student's t-test and linear regression were used for statistical analysis. Results: There was a mean 14% enlargement in the femoral tunnel (from 9 mm at postoperative 2 weeks to 10.3 mm at postoperative 1 year) and 18% enlargement in the tibial tunnel (from 10.4 mm at postoperative 2 weeks to 12.2 mm at the postoperative 1-year follow-up). Both of these were statistically significant (P = 0.005 for femoral tunnel enlargement and P = 0.008 for the enlargement of the tibial tunnel). No statistically significant association was noted between tunnel enlargement and clinical results. Conclusion: Compared to previous similar studies, less tunnel widening was observed in the present study. We come to a conclusion that less aggressive rehabilitation program and anatomical graft fixation technique can help achieve the goal of minimum tunnel enlargement after ACL reconstruction. Vascular injury is a complication after humerus fracture that has been associated with shoulder dislocation, fracture proximal, and supracondylar region of the humerus. Combined vascular and bony injuries are diagnosed and referred earlier than 24 h. However, delayed presentation of brachial artery injury after shaft humerus fracture beyond the golden period of 6 h has been little reported. In this series, we aimed at evaluating the likelihood of limb salvage. Case 1, was 24 years old with open fracture that presented after 18 h, managed with fasciotomy with arteriotomy with thrombectomy followed by temporary skeletal stabilization and definitive thereafter. Case 2, was 39 year old with closed fracture, presented after 76 h with digital gangrene in which definitive fracture fixation was first done followed by transbrachial thrombectomy with amputation of digits. Our results were good with minimal morbidity due to joint stiffness, restriction of range of motion, and complications of ischemia. The advent of locking plates has brought new problems in implant removal. Difficulties include cold welding between the screw head and locking screw hole, stripping of the recess of the screw head for the screwdriver, and cross-threading between threads in the screw head and screw hole. We are describing a technique which allowed us to remove such cold-welded, jammed single screw with simple instruments at hand and complete the prescribed operation smoothly. 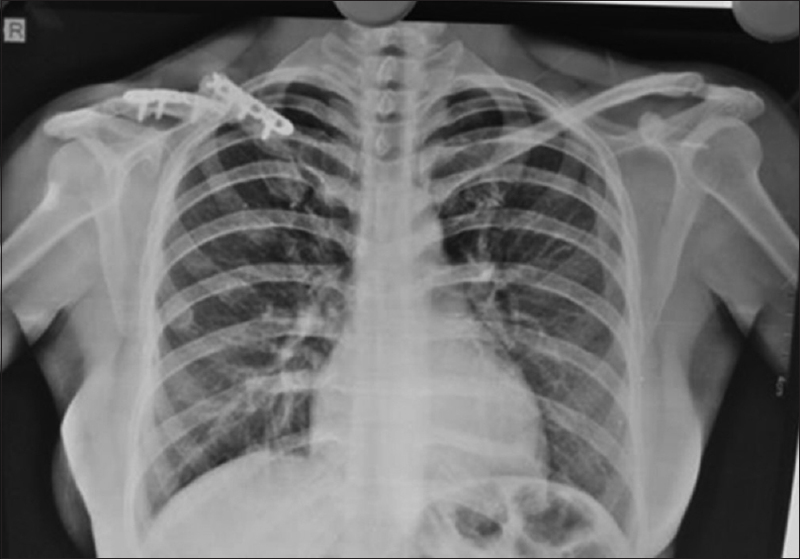 A 32-year-old female patient reported to us with a broken clavicle locking plate, who was operated 3 years back for fracture clavicle right side. The patient had complaints of pain and deformity in the right clavicle region for 3 months following lifting heavy weight. X-ray showed broken implant with nonunion of clavicle. The patient was planned for implant removal, freshening of edges, and fixation with anatomical clavicle plate with bone grafting. All the screws were removed with standard screw driver when it was found that the second screw of medial broken plate was jammed, round headed, and cold welded. We bent both ends of broken medial plate around screw and removed screw by just rotating bent plate anticlockwise. Fracture ends were freshened and fixation was done with anatomical clavicle locking plate and bone grafting. The patient did not develop any postoperative complication. This technique is very quick, easy to perform, and inexpensive without the use of plate cutting blade, burr, hollow mill, and other instrumentation. This technique can be used in peripheral hospitals in India where advanced gadgetries may not be available. There is no problem of thermal necrosis to the bone or the surrounding soft tissue. Osteoporotic bone is a limitation of the above method as the bone may break while bending the plate and is possible only with a single locking screw.